I will like to express my sincere gratitude to your team and everyone involved for stock [...].l have received the car in a very good condition as per your description. The only problem was the battery. I replaced the battery the car drives very well lm extremely happy. I will be happy to do more business with you in future.The car met my expectation and the the value for me.lm very proud of your Team. I was impressed by Momon's communication and problem solving ability together with one of your team members from the Shipping Team. Keep it up.Your feedback was greatly. I won't be able to mention everyone but lm happy and will surely like to buy from you again. We would like to extend our profound thanks and appreciation to you and your team at Trust Company for the very able and professional manner in which you, in particular, handled the purchase of our vehicle, the shipment and our claim after we received the car. You kept us fully informed during the entire process and were always very responsive and helpful. Your services were second to none. Please rest assured that we will surely recommend Trust Company Ltd., to as many of our colleagues and friends as we can. Once again please share our sentiments with you colleagues. Thanks. [The HIACE] arrived at my home last Saturday. It is in excellent condition. You have been such a tremendous help in acquiring all units I purchased. We are Frederick &. Denise McDavid, from Guyana S.A.
We can attest to the Quality of our 2007 Auris. Trust lives up to its name in the quality of its vehicles, along with excellent customer service. We will highly recommend Trust to our family and friends. went to resolve the matter and we worn the case. I am sending you pictures which were taken at the border post. Today I had the most wonderful start to the New Year. There it was in my driveway, my 2010 VW Jetta (Bora). Top quality as promised. Excellent condition. A beautiful car well worth every cent I spent on it. Everything went as scheduled. Not a single day's delay. It has been such a pleasure doing business with Trust Company Ltd. and I will definitely be coming back to you for my next car purchase. Happy New Year from one very satisfied customer. Hi! Just want to say I received the vehicle last week. Thank you so much for your excellent customer care. I love my car, its in good shape. Cheers! Thank you Trust company for the great car and great service! The Rav4 we ordered had a problem with the port in Durban (which had nothing to do with Trust Co.) and Trust went above and beyond to make the car whole again. Our new Rav4 is in great shape, and we recently took it on a trip of over 2,000km to Lake Tanganyika and back. This is to let you know i received the vehicle in order. Just now to modify it to fit the "kenyan roads". Thank you for the service. I have recently purchased a 2007 Subaru Forrester. The car is in excellent condition except for a minor bump that must have occurred during the shipping. Their service was fast and communication was swift. My next car will definitely be from Trust Japanese Vehicles. personally for agreeing to hold the vehicle for us. Thank you for the excellent service that you have provided to us. My husband and I are happy with the way you handled our request. We wish your team all the best. hi how are you guys doing hope all is well. this message is coming from me and my husband here in grand turk, turks and caicos islands. we just want to extend our kind words and praises to all of the top-of-the-line services we've had from Trust. we purchased a vehicle and spare parts from you guys and you never never never ever disappointed us. all transactions were done accurately and handled professionally even we both are on the opposite sides of the world, most of the time its Mr. Suzuki we're dealing with, i think his first name is Tamio im not sure of the name but my husband just fondly calls him Suzuki. but anyways, a big big big big thumbs up to Trust Co. keep up the good work may everyone be blessed with good health and more power to all of you. i heard about SBT but honestly i said no no no, the only car company i trust in Japan is TRUST and will always be. God bless the Trust management and staff. hope y'all getting your well-deserved credits and benefits for doing and giving the best customer service. Dear Yuki, this is the Nissan Skyline MT, my husband purchased from Trust few years ago. We're glad you got our message. He also ordered spare parts such as computer, water pump, timing belt & coils in the past.[...] 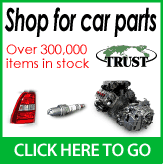 I recommended to some friends if they need spare parts or vehicles try Trust its soo worth it. Also the tracking is very reliable without a single hassle. Have a pleasant day everyone! I write to say thank you for everything with the after sale support. My customer [...] messaged me saying "the van is running like a dream." Once again, thank you very much for offering the service you do. I received the vehicle today, and it's in quite good shape. Thanks! This is to happily inform you that I received my vehicle (Toyota Vanguard) in excellent condition. I take this opportunity to thank you and the entire team of Trust Company for the good work you do. I look forward to buying another vehicle from you.